In a large pot of boiling, salted water, add farro and cook until just tender, about 15 to 20 minutes. Drain well and set aside to cool to room temperature. In a small skillet, melt butter over medium-low. Stir in garlic and cook until fragrant, about 1 minute. Scoop garlic mixture out into a medium bowl - stir in cooled farro, ricotta, egg yolks, whole egg, Parmigiano-Reggiano, mozzarella, parsley, salt, pepper, nutmeg and crushed red pepper. Lightly butter a 9" pie plate, then add the breadcrumbs - shake plate around to coat the sides and bottom, knocking out any excess. Scoop farro mixture into the plate, smoothing the top with an off-set spatula. 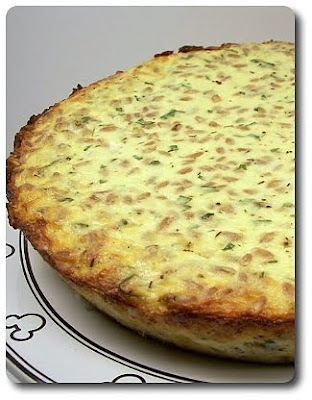 Place into the oven and bake until the tart is just set and the top is lightly golden, about 35 to 45 minutes. Remove and place plate onto a wire rack to cool until it is warm to the touch before serving. This was soo different but I really enjoyed it. A different kind of twist to something similar to a quiche. Crustless, cheesy goodness! Anon - Thanks for the feedback! I'm glad you liked it!